Prashantha B, Bhavani Nivetha, Mansoor Ahmed, Mudassir Azeez Khan, Rajagopal Rajendra. Background: In elderly mental disorders are overlooked or underdiagnosed. Almost 20% of elderly above 60 years of age suffer from a mental or neurological disorder, and the most common ones are dementia and depression. Studies have pointed out the increased prevalence of depression in oldâ€‘age homes. Objectives: The objectives are as follows: (1) To estimate and compare the prevalence of geriatric depression among people living in public and private oldâ€‘age homes and (2) to study the factors associated with depression and compare the facilities in public and private oldâ€‘age homes. 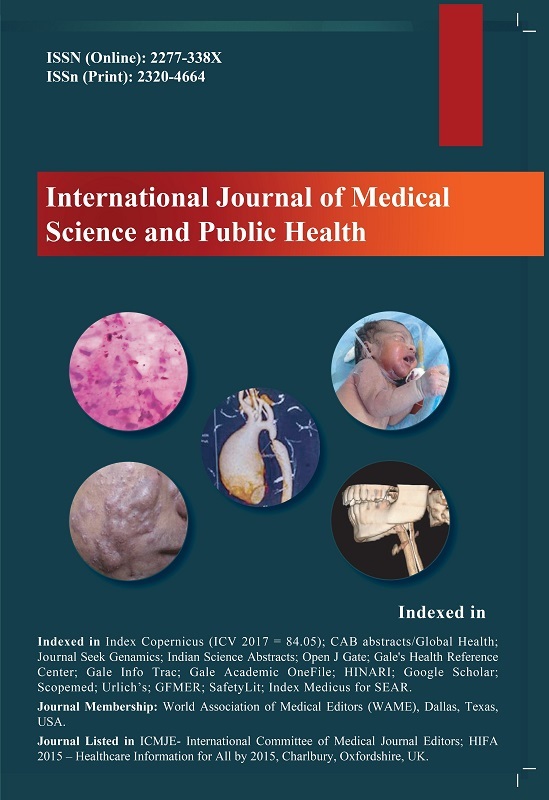 Materials and Methods: A crossâ€‘sectional questionnaireâ€‘based study was conducted among geriatric population in oldâ€‘age homes of Mysore. Depression was assessed using the short form of geriatric depression scaleâ€‘15, cognitive impairment using Miniâ€‘Mental State Examinationâ€‘30. Data relating to sociodemographic variables and facility assessment were collected separately. Results: The overall prevalence of depression in oldâ€‘age homes of Mysore was 33.3% (46.3% in public and 21.6% in private oldâ€‘age homes with P = 0.002). The facilities offered and reason for stay also varied significantly across both homes. Marital status, education, economical dependency, and uncorrected impairment were the factors associated with depression. Among the psychosocial factors, feeling of loneliness, and neglect were significant predictors in both settings. Other psychosocial factors such as feeling satisfied by the status of their children’s life, advice taken by their children, financial and personal losses in the past 1 year, and presence in social events were significant predictors only in private oldâ€‘age home. Conclusion: Prevalence of depression in the oldâ€‘age homes differs significantly with the type of home, the facilities offered, and the reason cited by the inmates for admission probably is the contributing factor for the variation in depression. 1.Saka MC, Ã–zer S. Bipolar bozukluk bir yÃ½llÃ½k izlem Ã§alÃ½Ã¾masÃ½. TÃ¼rk Psikiyatri Dergisi 2001; 12:283-292. 4.Biederman J, Petty CR, MA, Byrne D, BA, Wong, P, J, Wozniak, MD, Faraone S. Risk for Switch from unipolar to bipolar disorder in youth with ADHD :A long term prospective controlled study. J Affect Disorder 2009 ; 119(1-3): 16&#8211;21. 5.Youngstrom EA, Arnold LE. Bipolar and ADHD comorbidty : Both Artifact and outgrowth of shared mechanism. Clin Psychol 2010;1(7): 350-359. 7.GÃ¼Ã§lÃ¼ O, Kamberyan K, Kutlar T. Dikkat eksikliÃ°i ve hiperaktivite bozukluÃ°u olan Ã§ocuklarÃ½n anne babalarÃ½nda iki uÃ§lu duygudurum bozukluÃ°u. DÃ¼Ã¾Ã¼nen Adam 2002; 15:164-172. 14.Akdemir A, Ã–rsel S, DaÃ° Ã�, TÃ¼rkÃ§apar H, Ã�Ã¾can N, Ã–zbay H. Hamilton depresyon derecelendirme Ã¶lÃ§eÃ°inin geÃ§erliÃ°i, gÃ¼venilirliÃ°i ve klinikte kullanÃ½mÃ½. Psikiyatri Psikoloji Psikofarmakoloji Dergisi 1996; 4: 251-259. 15.KaradaÃ° F, Oral ET, YalÃ§Ã½n F.Young Mani Derecelendirme Ã–lÃ§eÃ°i&#8217;nin TÃ¼rkiye&#8217;de geÃ§erlik ve gÃ¼venirliÃ°i. TÃ¼rk Psikiyatri Dergisi 2001; 13:107-114. 17.Eser E, Fidaner H, Fidaner C ve ark.YaÃ¾am Kalitesinin Ã–lÃ§Ã¼lmesi, WHOQOL-100 ve WHOQOOL-BREF. 3P Dergisi 1999; 7: 23-40. 19.TuÃ°lu C. Ã�ahin Ã–.Ã–. EriÃ¾kin Dikkat EksikliÃ°i Hiperaktivite BozukluÃ°u: NÃ¶robiyoloji, TanÃ½ SorunlarÃ½ ve Klinik Ã–zellikler. Psikiyatride GÃ¼ncel YaklaÃ¾Ã½mlar 2010; 2(1): 75-116. 21.Tharoor H, Chauhan A,Venkata PS, Sharma N.A cross-sectional comparison of disability and quality of life in euthymic patients with bipolar affective or recurrent depressive disorder with and without comorbid chronic medical illness. Indian J Psychiatry 2008; 50:24&#8211;29.